Rely on unthirsty flowers to provide a bright display in the garden. Drought-tolerant, they are ideal flowers to grow when summer kicks in and the temperatures rise. Grown in a wide range of shapes and sizes, they also grow in a rainbow of bright colors, like orange and red to pink and yellow. Often, flowers that require little water are also low maintenance plants that keep the garden in bloom, but without the fuss. Purple coneflower (Echinacea purpurea) is a perennial flower that is suitable in USDA zones 3 to 9. Its purple daisy-like flowers grow up to 5 inches wide and bloom from midsummer to early fall. Purple coneflowers reach heights up to 6 feet tall and a spread of 1 to 3 feet wide. They are drought-tolerant flowers that require little water to flourish and thrive. Surrounding the ray of bright petals are the copper to orange cones that attract butterflies and birds to the garden. Purple coneflowers grow in upright clumps and are ideal plants to grow along a flower bed or borders for their showy display. 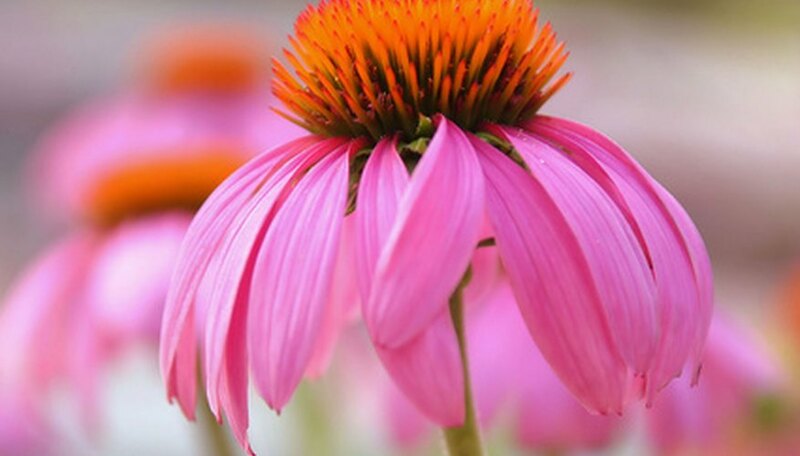 Purple coneflowers require full sun to part shade and well-drained, deep soil. Versatile, they are tolerant of heat, humidity and poor soils. To extend the flowering season, deadhead or remove the spent blooms as soon as they are noticeable. Agastache ‘Summer Breeze’ (Agastache ‘Summer Breeze’) is suitable in USDA zones 6 to 10. Their 1-1/2-inch-long, tubular blossoms are translucent and grow along the upper third of each stem. Agastache summer breeze reach up to 3 feet tall and wide and have a clumping and vigorous growth rate. According to Fine Gardening Magazine online, “in hot weather, peach, champagne, and soft pink are its colors, while in cooler months the flowers darken to pale copper and medium rose.” Agastache is a drought-tolerant, perennial flower that attracts hummingbirds to its masses of summer-blooming flowers. They grow best in full sun and well-drained soil. Russian sage (Perovskia atriplicifolia) is a woody perennial flower that produces masses of blue to lavender flowers on the upright spikes. They are suitable in USDA zones 6 to 9 and reach heights up to 3 feet tall with a spread of 1 to 3 feet wide. Russian sage is drought-tolerant and can withstand periods of limited moisture. The aromatic, dissected foliage is silver to green and when crushed, highly aromatic. The gray to white stems holds the two-lipped, tubular flowers that grow in a cluster of panicles. Russian sage blooms last from summer to early fall and grows best in full sun. Easy to grow, they require well-drained soil that is alkaline.